Montana 680t features a dual-orientation, color touchscreen that’s glove friendly, comes preloaded with TOPO U.S. 100K maps and includes a 1-year BirdsEye Satellite Imagery subscription. The digital camera provides high-quality images, excellent resolution and automatically geotags photos with coordinates. 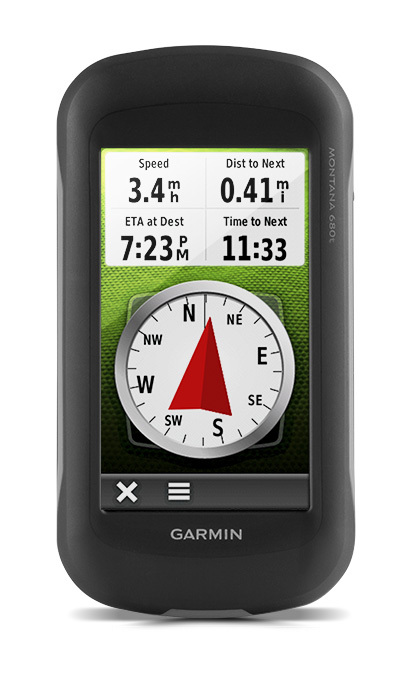 The handheld includes 3-axis tilt-compensated compass, barometric altimeter and access to both GPS and GLONASS satellites for improved positioning and typically faster fixes. Montana 680t has a vast 4-inch, sunlight-readable touchscreen display, giving you vivid colors and high-resolution images. Its easy-to-use touchscreen means you’ll spend more time enjoying the outdoors and less time searching for information. 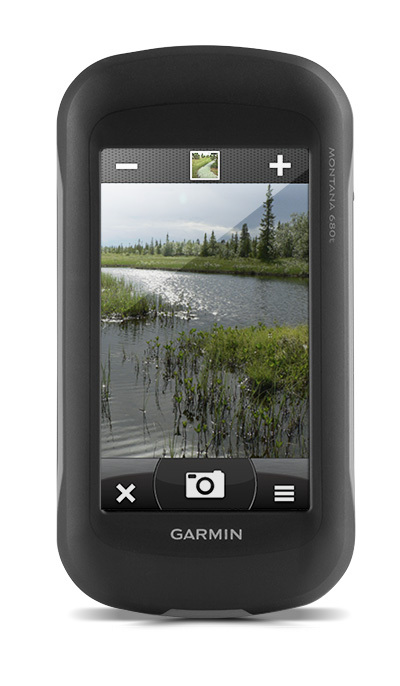 Capture locations and memories with Montana 680t’s 8 megapixel digital camera. Each photo is automatically geotagged with coordinates, allowing you to navigate back to that exact spot in the future. Keep track of your photos and see their locations on a map using BaseCamp™. Insert a microSD™ card for more photo storage or to view pictures from other devices. With an array of compatible mounts, Montana 680t is designed for use on ATVs, in boats, as a handheld or in your car or RV. Use the auto mount with City Navigator® NT maps for spoken, turn-by-turn driving directions or the rugged mount for your motorcycle or ATV. 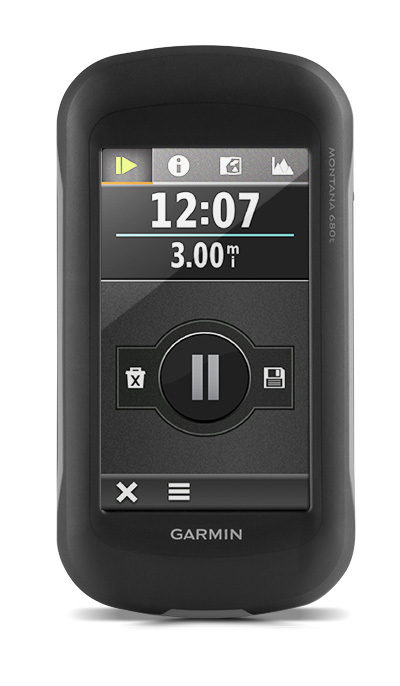 With Montana 680t, you can share your waypoints, tracks, routes and geocaches wirelessly with other compatible Garmin GPS users. Just press “send” to transfer your information to similar devices and let the games begin. With its high-sensitivity GPS and GLONASS reception, WAAS-enabled receiver and HotFix® satellite prediction, Montana 680t locates your position quickly and precisely and maintains it. Whether you’re in deep woods or just near tall buildings and trees, you can count on Montana 680t. 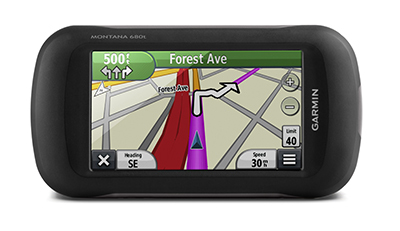 Montana 680t has a built-in 3-axis tilt-compensated electronic compass, which shows your heading even while you’re on the move or not holding it level. The barometric altimeter tracks changes in pressure to pinpoint your precise altitude, or use it to plot barometric pressure over time to help keep an eye on changing weather conditions. With a one-of-a-kind dual battery system, the 680t gives you the option of using the rechargeable lithium-ion pack or traditional AA batteries. The 680t supports paperless geocaching GPX files for straight-to-device uploading of geocaches from Geocaching.com. No more manually entering coordinates and paper print outs, Montana 680t stores and displays key information, including location, terrain, difficulty, hints and descriptions. The track manager feature helps organize and navigate through waypoints, routes and track logs (easily start/stop recording tracklogs). Our free BaseCamp software lets you view and organize maps, waypoints, routes and tracks. This free trip-planning software even allows you to create Garmin Adventures that you can share with friends, family or fellow explorers. BaseCamp displays topographic map data in 2-D or 3-D on your computer screen, including contour lines and elevation profiles.